When word broke about Mayor Rahm Emanuel's behind-the-scenes role pushing for the merger between American Airlines and U.S. Airways, I happened to be flying on an American flight to New York—my legs wedged against my chin, my rowmate's elbow just about in my ear. 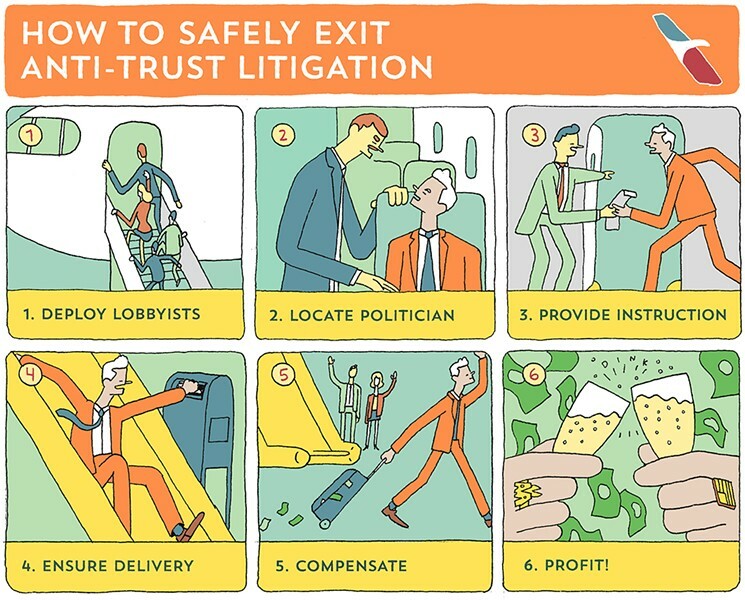 It turns out that in the fall of 2013, the mayor was quietly lobbying the U.S. Department of Justice to drop its antitrust lawsuit against the airlines, according to a ProPublica investigation by Justin Elliott published last week. For the record, I'm not—repeat, not—blaming Rahm for high ticket prices, crowded planes, outrageous baggage handling fees, and the other unpleasant realities of traveling in this new age of airline consolidation. Just in case some of you think I blame him for everything. But ProPublica's revelations remind me that this "new" Rahm is just that—a relatively new political creature invented out of necessity during the fallout over the Laquan McDonald video. Incidentally, Emanuel delivered his annual budget address the same day that Elliott's story broke—and just one day after the mayor agreed to a deal with the Chicago Teachers Union, thus averting a strike. 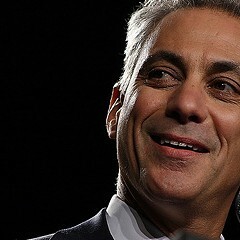 In his speech, Emanuel was giddy about that teachers' deal—it was the first thing he mentioned. Not surprisingly, he didn't mention the ProPublica piece. In his address, Emanuel sounded less like the mayor we've come to know these past six years and more like Jesus "Chuy" Garcia, his former opponent, running for mayor circa 2015. Just about everything the mayor said he's proud of having done this year is something that Garcia said had to be done back when he was running against Rahm. 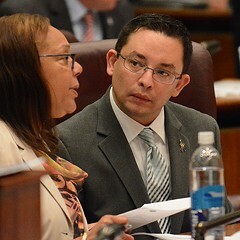 Make peace with Karen Lewis and CTU by raiding the city's TIF funds? Hire as many as 1,000 new cops? Raise taxes to pay off pensions instead of trying to force firefighters, cops, and teachers to take cuts? 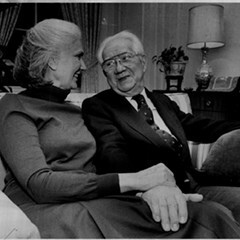 Garcia, the progressive, proposed such measures during his campaign. Emanuel, the neoliberal, said they wouldn't be necessary. 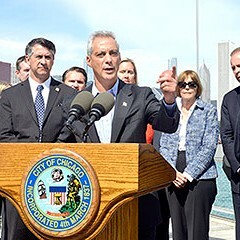 Next thing you know Rahm will be growing a mustache—just like Chuy's. Emanuel also vowed in his speech to keep fighting to close the gap between the haves and have-nots—a favorite mayoral theme post-Laquan McDonald. But I'd say that American Airlines would fall into the "haves" category of this equation. Which may explain why the mayor was so eager to help the company back in 2013. In those days, Emanuel was more of a trickle­down kind of guy, seemingly determined to battle income inequality by, um, making the rich even richer. In the case of American, the company was looking to make millions by merging with U.S. Airways. But in August 2013, the Justice Department sued to block the merger on the grounds that it violated antitrust law. That's when American initiated a counterattack, attempting to force the DOJ to drop its case. According to ProPublica, one of American's lobbyists, Daniella Landau, had direct e-mail contact with Emanuel, who of course knew many Obama administration officials from his days as White House chief of staff. "Rahm: Per your request, here is the proposed joint letter in support of the AA/US merger for your consideration. This is the letter, by the way, [a publicist] raised with you in D.C. last week and that you later discussed with me." Man, if Emanuel had only been this chummy with Karen Lewis we'd have avoided a whole lot of turmoil. "The ultimate goal is to go public with the letter after October 1st," Landau continued. "AA/US are also hoping you will agree to provide 2-3 quick phone interviews with key reporters following release of the letter for reinforcing the pro-merger message. Doable? Please let me know." In short, American was asking Emanuel—and four other big-city mayors—to make the airline's case before the Obama administration. And Emanuel did just that. He left the letter penned by lobbyists largely untouched, signed it, and sent it to Attorney General Eric Holder. Emanuel also went to Washington to meet with Obama administration officials on the matter. In early November 2013, the Justice Department dropped its antitrust lawsuit—a decision that Emanuel immediately hailed in a press release. Then, in early 2014, he received $53,000 in campaign donations from various American Airline executives. The Chicago Tribune broke the news of those contributions in February 2015, as part of a larger story on Emanuel's fund-raising prowess. Elliott's exposé now puts those contributions into context. In the Tribune story, Emanuel's spokeswoman said the mayor believed the merger was good for expanding O'Hare. But there were other beneficiaries too. "Wall Street has cheered the effects of the deal," Elliott writes in his investigation. "A 2014 Goldman Sachs analysis about 'dreams of oligopoly' used the American-US Airways merger as an example. Industry consolidation leads to 'lower competitive intensity' and greater 'pricing power with customers due to reduced choice,' the analysis said." Dreams of oligopoly? Didn't they open for the Shins during Rahm's 2011 inauguration party? But here's my point: reading the ProPublica investigation in conjunction with Rahm's recent budget address reminds me that for all his talk of reform, he's never apologized to us for who he was and how he operated in his first term. I know, it's probably unrealistic to expect him to come out and say, "Yeah, I know I really was Mayor 1 Percent, what with closing those schools and clinics and everything. But I've seen the error of my ways." 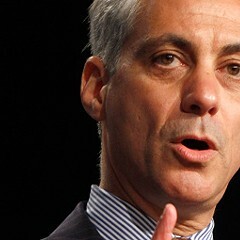 Instead he pretends as though the pre­ McDonald-video Rahm never existed. The novice 15th Ward alderman wants the city to spend the money not on trees or vacant buildings, but on stopping gun violence. 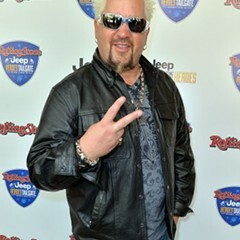 Did you read about the airline industry, the shootout in Wicker Park, and the crap on a fake Guy Fieri menu?